Today we have a mashup of all the fire starting videos Jack has made over the years (we will continue to update as we explore new and exciting fire starting techniques). These various methods can be used while hiking, camping, during a disaster, for prepping or just for fun. So have a watch and I hope you enjoy our videos. In this video, Jack walks everyone through the simple steps of using a 9-volt battery to ignite steel wool. While this might no be the best backup method for hiking, it has a valuable use during a disaster. In this video Jack shows us how easy it is starting a fire using a little hand sanitizer. Hand sanitizer can be found everywhere and most people even take it outdoors on adventures. Not only is hand sanitizer good at keeping your hands clean, all the alcohol in it can be used to start a fire. This is a viable backup method to starting a fire while hiking. In this video Jack is trying out Insta-Fire for the first time. Insta-Fire is a unique product that has the ability to burn in any condition. The product can burn when wet, on snow, and even float on water while burning. Jack recommends repackaging Insta-Fire so it will fit bettter in your pack. Jack walks us through using double lenses to start a fire. Jack uses the lenses from a pair of glasses he paid very little for at the local dollar store. Just be mindful, this will work better with more sunlight. 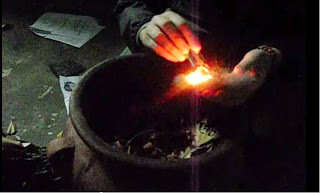 In this video Jack walks us through the steps of creating homemade fire starters. All you need is petroleum jelly (Vaseline). These fire starters are cheap to make, easy to light, and will burn for a few minutes. SO go ahead and give them a try on your next outdoor adventure. In this video Jack is starting a fire using a tried and true flint and steel set. Flint and steel are one of the most widely available backup fire starting methods. Flint and steel sets are available in most big box stores. Plus, they even the cheap sets are durable and safe enough to keep you safe in an emergency situations. Let us know your go to method for starting fires in an emergency situation. Interested in more videos then check the Adventures With BeeGee YouTube Channel.